The second day of enjoying life as a stay at home mom of two kids was marked with another diy project. How exciting! Thanks to cyclone Vardah, schools are closed until next Monday but the day care is functioning as usual. Since my two-year-old is so bored at home in spite of having her sister along with her all the time and her own iPad, she was eager to go to day care. Good for me! When I went to drop her at day care on 15 December, the notice board read ‘please send the children dressed up for Christmas on 16 December 2016’. I didn’t fully understand what was meant by ‘dressed up for Christmas’. So, I asked the person in-charge and she said, “oh, anything Christmas-related”. We don’t celebrate Christmas and we did not have any Christmas-y tshirt or a frock for Anjana. Santoshi, my elder daughter, had an idea – punch a few holes in a carton for Anjana’s legs, wrap it up with paper and ribbons and Anjana’s could be a Christmas gift. Good idea, but won’t work for a 2 year old and definitely not for Anjana. I thought of buying a Santa Claus mask and team it with a red tshirt and a pair of red leggings, but it was easy too common. Reindeer or sleigh? No way, too complex and too little time. And, more importantly, no internet! Internet connectivity has been affected since Monday 12 December 2016 and we do not know when it would be restored [finally restored on 23 December]. But, a Christmas tree? Yes, it could work. Cardboard, green paper, decorations, etc. – all these were already in my stationery and craft boxes. I was a bit sceptical about using cardboard because even Santoshi couldn’t bring it back in one piece [the fin in the mermaid costume never came back and the Veena in her Saraswati costume came back home only after two days, that too in a bad shape]. Actually, my problem wasn’t whether it would come back. It was more about the costume staying in place at least till the end of the photo session at the day care. The crayon costume that I had made for Anjana in November 2016 was a hit because it was easy to make and no hassles in putting it on. So, I decided to make the Christmas tree in a similar fashion – using fabric as the base. Step 1: Lay the green fabric flat and fold it over so that there are two overlapping layers, with the wrong side [or the inside] on top. Step 2: Measure the height of the tree from to to bottom and mark the top and bottom ends on the fabric. Since my daughter was already at the day care, I used the crayon costume for vertical measurement. 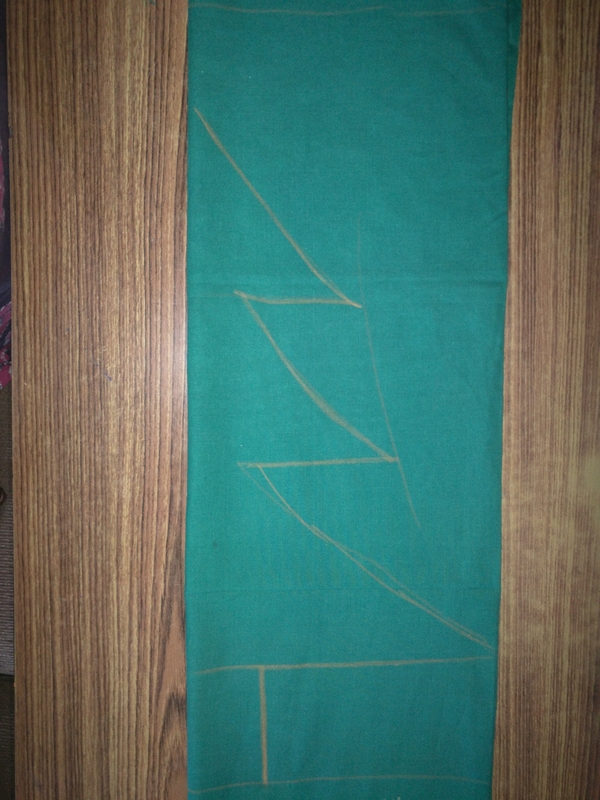 Step 3: Mark the width on the fabric – I used one of Anjana’s tshirts. Step 4: Fold the fabric over once again – now you should have four overlapping layers. Step 5: Keeping in mind seam allowance, draw the outline of the tree. 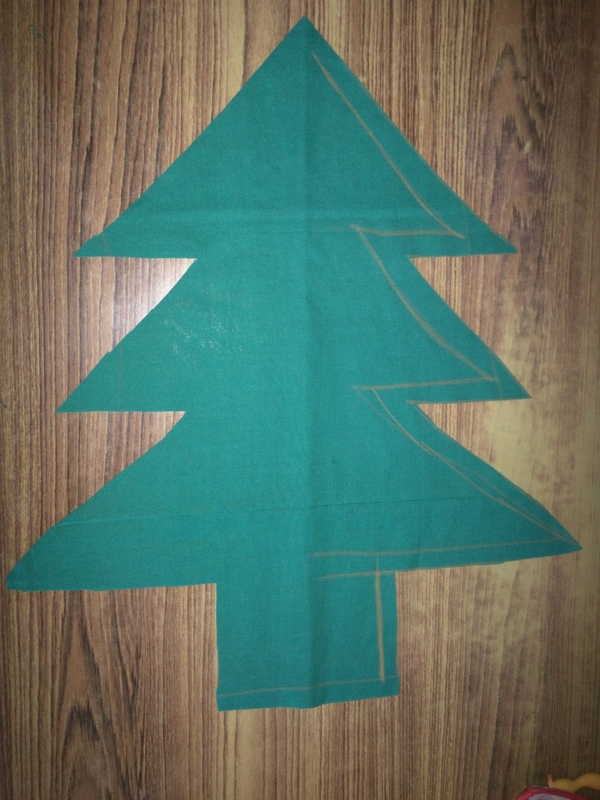 Since the fabric is already folded, draw only a half of the tree. The costume is intended to cover the toddler from bottom of the neck to ankle [give or take an inch or two]. So, the maximum width could be the bottommost branches of the tree [close to the calf muscle] and the tree bark below that. Step 6: Draw another outline of the tree considering the desired seam allowance. I have used about half an inch of seam allowance. Step 7: Cut [all four players of fabric] along the outer lines. Step 8: Open the fold – you will have a full tree. Step 9: Right sides of the fabrics facing earth each other, sew on the outer lines. Do not sew the part marked with x in the pic and do not sew on the bark portion either. Step 10: Repeat step 9 for the inner lines. Step 11: Snip small triangles out as shown in the pic. This is needed so that when the fabric is turned right side out, the seams will lie flat inside. Step 12: Turn the tree inside out [remember the portion where we did not sew – that’s the space using which we are going to turn the tree out]. Ensure that the corners are pulled gently out so that you get the intended shape. Mine didn’t come out so well, but it’s OK. Step 14: Decorate the tree in any manner as you wish. I glued some craft items. Step 15: Cut a star out of the glitter foam sheet and paste it to the headband with a cardboard backing. Step 8 onwards in crayon costume will show you how to do this [paste the star in place of the triangle in crayon costume]. Step 16: Using a few cardboard strips, make small boxes, wrap them with paper, add a ribbon or a glitter tape in place of ribbons, glue them to the bark to resemble Christmas gifts under the tree. The dark green one is the cap of a baby shampoo bottle, he he. Step 17: Pin the tree to the toddler’s clothes using safety pins. I have pinned it to the t-shirt at the top and the end of the branches, leaving the last branch and the bark unpinned so that the costume would not hinder movement. If you are using felt, it could be a no-sew project. Ignore all about seeing on the instructions above. Cut the felt to shape of a tree, glue the bark portion, glue all decorations and attach it to the toddler’s clothes. Here is my little Anjana with the christmas tree pinned on to her t-shirt. The Christmas tree could also be a cute wall decor if you wish to repurpose it! This is another DIY costume. It is again for my younger daughter Anjana. As she is in the playgroup, they have ‘colour day’ celebrations once in two months. The first colour day was yellow day and she went in a yellow t-shirt. As I dropped her at the playgroup that day, I realised that she was supposed to go as a slice of cheese and I had totally forgotten about it. When the yellow day photos came out, she was nowhere to be seen. I felt extremely guilty because I have never forgotten anything for Santoshi and this was the first time I had to do something for Anjana and I forgot. It was colour red this time and I proactively asked them if I could send her as a red crayon (clearly, hibiscus or any other red flower or Angry Bird or Elmo is a lot of work and apple was just common). The teacher happily agreed to red crayon. Next step was, obviously, googling for ‘diy crayon costume’. I got the idea mainly from here. I have not (as I always do) followed the instructions fully and have made changes to suit my child and the materials that I have. In a recent clean up activity at home, I consolidated all of my scrap fabric pieces in one place (they were in 2 bags and a cardbooard box before). I realised that there were different shades of red fabrics which were waiting for their destiny to be fulfilled. So, I took a piece of red fabric which was solid and lightweight and also easy to sew on. 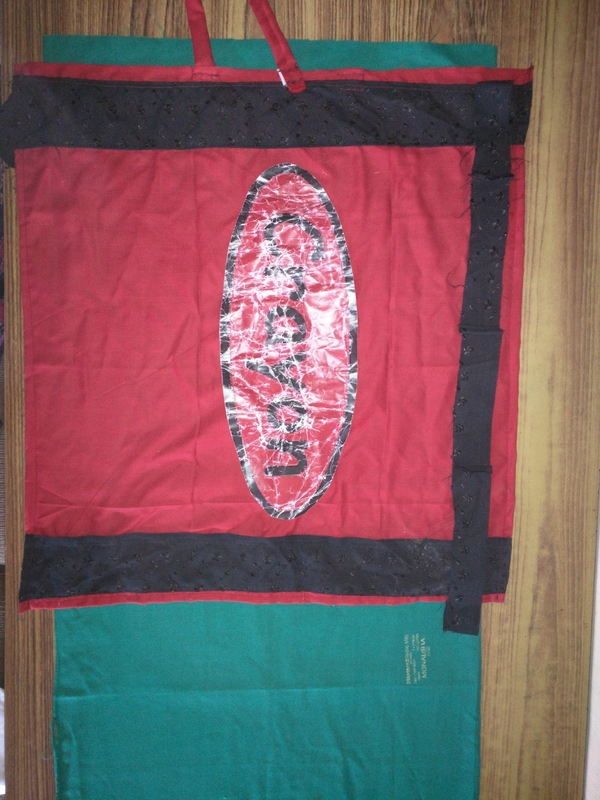 I also took out a long, thin piece of black fabric for the design. Design: The costume has two parts – crayon body and the crayon top. Crayon body: The design was more like an apron (strap around the neck) but also tie backs behind the chest and the bottom ends will be open to allow free movement. For the first time in all my project, I also used the measuring tape and wrote down the length and breadth of the costume. The finished piece had to measure 20 inches (chest) in circumference and 18 inches in height (chest to ankle). 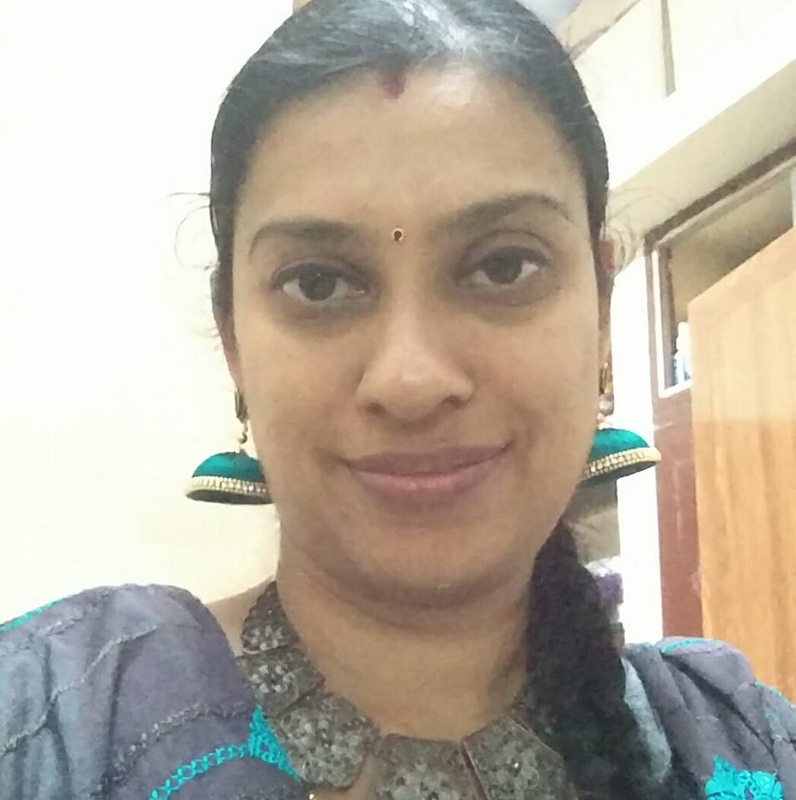 I added a strap for the neck because the costume would definitely fall down despite the tiebacks behind the chest – as it happened in my elder daughter Santoshi’s Wonder Woman costume. I also decided to add veclro to the neck strap because without an opening, it seemed a little difficult to put the costume on and remove it. Why go through the discomfort, when two pieces of veclro could resolve the issue? Step 1: Cut the fabric as per the measurements. Step 2: Sew the (shorter) black border on the bottom. Step 3: Sew the other black border on the top, aligning the centre of the black fabric to the centre of the red fabric so that the tiebacks are of equal length. Step 4: Sew the neck strap piece as a tube and turn it inside out using a safety pin. Step 5: Sew one end of the neck strap to the red fabric. Step 6: Attach a piece of velcro to the other end of the neck strap and the other piece of the velcro to the wrong side of the red fabric. Step 7: Add the ‘crayon’ print out to the centre of the red fabric using fabric glue and let it dry. Good job, the first part is done! While it dries, go on to the crayon top portion. Step 8: Align the centre of the 8 inch long piece of cardboard to the centre of the hairband. We are using cardboard strips to give the crayon top a firm backing. Otherwise, the crayon top may (read will) start to droop like the minnie mouse ears in the earlier costume. Step 10: Paste the shorter strip of cardboard horizontally on the bottom of the folder piece of cardboard. Trim the edges. Step 11: Add glue and paste the red triangle on the cardboard structure and let it dry. Congratulations! You have successfully completed the DIY crayon costume!! All you need now is a toddler to put the costume on. Here is mine with a red frock beneath the crayon costume and a pair of red shoes! Hope you found this helpful! There are other posts here on making diy costumes – do read those posts too. Thanks!